Most of the columns in this series have concentrated on specific information sources - generally with several examples from my own family history research. Column 16 took a different approach - looking at a variety of sources in an attempt to learn about one specific ancestor. For the individual used as an example in that column there were very few records available in the normal sources. This column addresses another specific individual who was hard to locate for a different reason. It's much harder to track women in data from the 1800s and earlier - especially a widow who remarries, unless you can find the marriage record. But, after I had finally found the right clues, her story was interesting. It just took a long time to find the information. In a previous column I mentioned the problems that I had in identifying the parents of one of my great grandfathers, Alexander F. Nicol. It was only after about 10 years of looking for clues that I found a family bible record buried in some papers in the possession of one of my 2nd cousins that identified Robert Nicol and Amelia Stockman as the parents of A.F. Nicol. And, since that record also identified Robert Nicol's birthplace in Traquair, Scotland, I was able to find more about his ancestry in the Parish records in Scotland. Also, from the bible record I knew that Robert Nicol died in Dearborn Michigan in 1850 - and these records also identified all of the children of Robert and Amelia. Even though the name was not listed correctly in the census index, I was able to find the 1850 census listing for Amelia and the three living children in Michigan. But that was the end of what I could find for a long time - other than the records for my gr.grandfather who ended up in Iowa where he spent the rest of his life. So what happened to Amelia and the other two children? Since Amelia was only about 36 at the time that she was left a widow with 3 children in 1850, it seemed likely that she had remarried. But I could find no marriage record for her in Michigan - nor any references to the two children, Caroline A. and Robert W. Nicol. Over the course of a number of years I researched Stockman and Nicol records - but did not find anything definitive. I've mentioned the various message boards that are available for posting queries and exchanging information for just about any surname or any locality such as those at www.rootsweb.com. From time to time, I look into what has been recently posted on message boards for a few surnames and locations of interest to me. While this is sort of like looking for a needle in a haystack, occasionally I find a bit of information that turns out to be useful in my own family research. About 8 years ago, in searching a message board for the names Amelia Stockman and Amelia Nicol I found a message from another researcher who was also looking for information about descendants of Amelia Stockman and Robert Nicol. I was able to contact her - and found that, between us, we had matching pieces of the puzzle. She was not a Nicol/Stockman descendant herself - but she had grandchildren who were - through her ex-son-in-law, and was trying to complete their family history record. After we had exchanged data it was then possible to find other records to help fill in the gaps. The line that she was researching was that of Robert William Nicol of Montana, who was the missing brother of my gr.grandfather - and she also had some information about their sister Caroline, plus information about Amelia and her second husband, David C. Elliott. Her information plus other records that I was able to find after knowing names and localities pretty well filled in the life of Amelia and her descendants after 1850 - although I still have not been able to pinpoint her ancestry other than that she was born in New York about 1814 and her parents were both born in Germany (from the 1880 census record). I found that after Robert Nicol died in 1850, Amelia and the three children had gone to northwest Indiana where her nephew, Isaac Stockman, lived in LaPorte County. The 1850 LaPorte County IN census also lists the family of David C. Elliott. His wife died about 1852 - and he married Amelia Nicol in LaPorte County on March 13, 1853. Their combined family lived there and in Illinois briefly, then moved to Bremer County, Iowa about 1855. In 1856 one of Amelia's sons, my gr.grandfather Alexander Nicol, was married in Bremer County - which was the beginning of the Iowa Nicol records that I had started with originally. I had found the 1860 census record for his family there many years ago. Now, knowing the right name to look for, I found that the family of David C. Elliott and his wife Amelia also was listed in the 1860 census in Bremer County - where they remained until 1862. Robert William Nicol, later in his life, wrote a series of articles that were published in the local newspaper in Hamilton, Montana, detailing the travel of the David C. Elliott family in two covered wagons drawn by teams of oxen beginning in Bremer County, Iowa in the Spring of 1862 and ending in the Bitterroot Valley of western Montana in December, 1864 - plus their story of survival over some very lean years in Montana. They had started out toward Oregon and made it to Fort Bridger (now Wyoming, then in the Utah Territory) in July, 1862. They remained there until the Spring of 1863, with some members of the family working for the Ben Holiday Stage Coach Line. In 1863 they went to Fort Collins, Colorado and remained there until March, 1864 - when they embarked toward Montana. They first went to Virginia City, then during the summer and fall of 1864 they took a contract to build a stage coach station at Bannock, Montana and, in late November, headed toward the Bitterroot Valley where they arrived on December 2 after a difficult journey over snow covered passes. 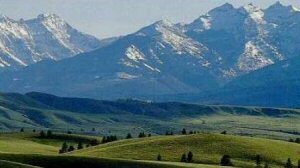 Along the way in 1863, Caroline Nicol, the sister of my gr.grandfather had met and married a man at Fort Bridger and they headed off to the newly discovered gold fields in Montana. Caroline's only son was born at the site of Virginia City, Montana in the gold fields of Alder Gulch in December, 1863. Later, Caroline and her young son rejoined the rest of the family in the Bitterroot Valley - where they were living with Amelia and David Elliott in 1870. Caroline remarried in 1872 and lived in Missoula until her death in October 1901. Robert William Nicol married and raised a family near Hamilton, Montana where he lived until his death in May 1921. My gr.gr.grandmother, Amelia Stockman Nicol Elliott and her husband also spent the rest of their lives in the Bitterroot Valley. Amelia died November 2, 1884 and is buried in the Riverview Cemetery in Hamilton, Montana. The cemetery records for that cemetery have been transcribed and are available on-line - where they can be found through the Ravalli County genweb site. Through the Montana contacts, I have a copy of a photo of Amelia made in 1878. 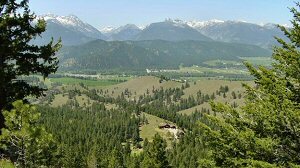 The Bitterroot Valley of far western Montana is beautiful but surrounded by rugged country. At the time the Lewis and Clark expedition passed through the valley in 1805 they were the first people other than Native Americans to see this area. They met the Shoshonis here - who guided them through the rugged Bitterroot Mountains on their way westward. It was 50 years later before the first permanent settlers came into the valley - not very long before my gr.gr.grandmother and her family made it here from Iowa in 1864 after two years of travel in covered wagons. There are many more details to this story that I find really interesting but that are beyond the scope of this column. These details of how people lived, when you can find them documented, make the lives of our ancestors far more interesting than just the bare vital statistics. The genealogical research aspect of this example is that, when you have a part of a family history story, someone else may have other pieces of the puzzle. If you can find them and put the pieces together you can sometimes make a far more complete picture.